I feel like I have a lot more WIPs then I usually do. I currently have 7 things on the needles and will be starting another project Monday (Westknits Mystery KAL!). SEVEN WIPs! I usually like to keep it to 4 or less, but… well… I’ve been a joiner of things lately and it’s keeping my WIP count higher then usual. Three of my WIPs are more like long term projects. Things that I work on occasionally, but don’t really get the majority of my knitting/crocheting time. The first is Matt’s Scarf, which I started in 2009. I should take a better picture of it, but as a 1×1 ribbed scarf with two colors, it’s not really that interesting to see the progress as it gets longer! It has seen quite a bit of progress, though, and it’s a great project to work on while TV or movie watching when I don’t want to pay much attention to my project. 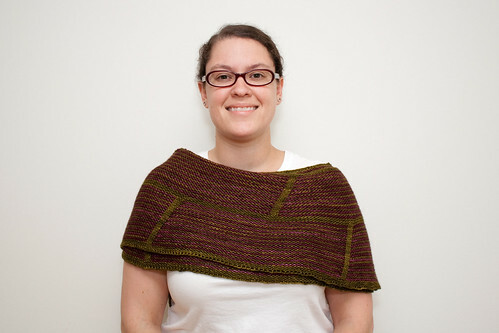 The second of my long term projects is the High Seas Shawl. I love how this is coming along, but with patterning on both right and wrong side rows, it’s a little slow going and it doesn’t make the best social or TV knitting. Right now it’s been set aside for other projects. 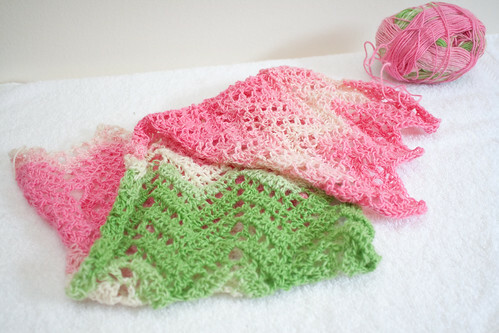 The third of my long term projects is the Spring Ripples Scarf. About two weeks ago now, I had to rip out all the progress I’d made because the gauge had changed from when I started to where I was. It was really obvious that even blocking wouldn’t save it. Ripped it all out, started over, and now I’ve worked back to where I was plus a little more. I like it better with the looser gauge I’m getting now then when I first started it. I think of short term projects as things that keep my attention that I want to work on it constantly. Long term projects are things that mindless (plain sock, a scarf) or something complicated that takes a lot of brain power. I enjoy knitting these types of long term projects, but usually they aren’t holding my attention so much that I only want to work on it the way the short term projects do. I usually keep at least one long term project on the needles and it’s often something I consider mindless that doesn’t require me to look at it much. Those kind of projects also make for great social knitting or crocheting and since I often find myself knitting in public with non-knitters, these are great to have. Do you have long term and short term projects that you work on? What sort of things are short and long term projects for you? My how July has flown by! I can’t believe it’s been nearly a month since I last blogged. I had the best of intentions (as always), but I’ve been a bit lazy about photographing my WIPs and FOs and without pictures, I end up not blogging. The heat we’ve been having hasn’t helped much, either. The last thing I want to do when I get home is put on a handspun wool cowl and take pictures in the house on the 2nd floor which is all too often about the same temperature as outside. Heck, that makes me not want to even TAKE pictures most of the time. Sadly, that 2nd floor room with lots of light and white space is the best room to take photographs of yarn, WIPs and FOs. The 1st floor, with it’s lack of ceiling and natural lighting, makes good pictures difficult, so I end up not doing it. Definitely doesn’t help that Matt has been working a different schedule then usual (four 10 hour days vs five 8 hour days). Since he’s been working later, 2-3 times a week I’m going directly to the gym after work and getting home around the same time as he does. Time just seems scarce lately! Anyhow… I have still been knitting, crocheting, and a little bit of spinning despite my lack of blogging about it. Since I last updated, I finished my Granny Square cowl. I did end up getting 24 squares from the yarn and ran out of yarn while crocheting the squares together. Thankfully I had some other handspun in a similar color to use to finish crocheting everything together. I like how it turned out! It’s going to be squishy and warm to wear this winter. 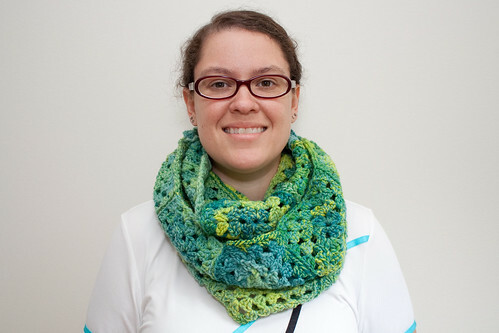 Notes: This was inspired by Mary-Heather’s Granny Square Cowl. No real pattern other then granny squares. I crocheted 24 squares total, then randomly placed them together. Pretty easy to do and man are those squares addictive! Lots of other WIPs on the needles, though I think that will be a whole post or two for another day. I think I’ll be able to make one of those WIPs into an FO before July is out. Here’s hoping! 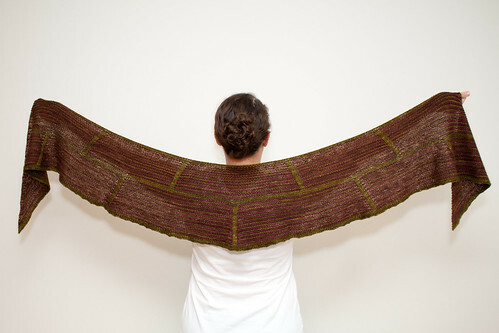 For those of you that are Westknits fans, you probably already know about the Mystery Shawl KAL he’s doing starting August 1st (Ravelry link), right? I heard about it right after the pattern went up on Ravelry and knew right away that, despite all the other things I’m working on including the one that is more or less deadline knitting, I wanted to join. I had a tough time picking out three colors for the shawl, but I knew I wanted it to be something I had in stash that I could use up. After a lot of pondering, I decided on using this color combo for it. 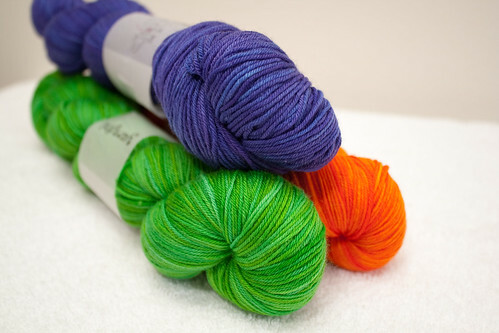 This is Yarntini Merino/Nylon Sock in Concord (top), Capirinha (bottom left), and Summer Sunset (bottom right). Not sure what color will be A, B, or C in the pattern yet. I’ll probably decided this weekend when I wind up my yarn or you can suggest which one should be my “main” color (C) in the comments! 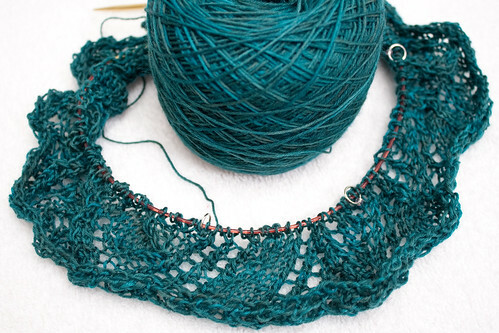 🙂 If you’re doing this Mystery KAL, what colors and yarn are you using? Decided on which will be A, B, and C? It seems like I’ve done a pretty good job of clearing off my needles recently, which left me with not a lot to work on. Okay, that’s not entirely true. I do have Matt’s scarf, the High Seas shawl which I haven’t even photographed yet, and that crochet scarf. They weren’t really holding my interest (either scarf) or weren’t good portable knitting (I’m looking at you High Seas shawl with your charting on every row). So… I started some new things! 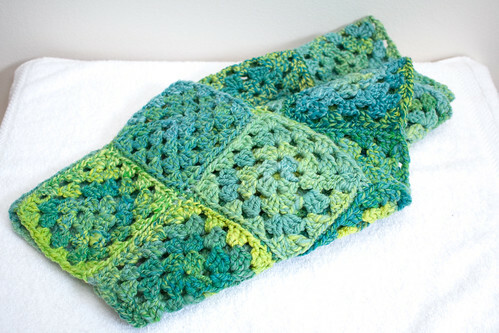 A while back I saw Mary-Heather’s granny squares cowl. I knew right away that I wanted to make one! I’m terrible about being random in color choices when it comes to knitting or crocheting and I didn’t much care for weaving in a lot of extra ends from having two colors, so I decided on using my handspun from last year’s Tour de Fleece that had enough color differences to make them a little more random. The Corriedale fiber was from Zarzuela’s Fibers in a special colorway for TdF last year. I have 16 squares so far (aiming for 24) and I like how they’re turning out! 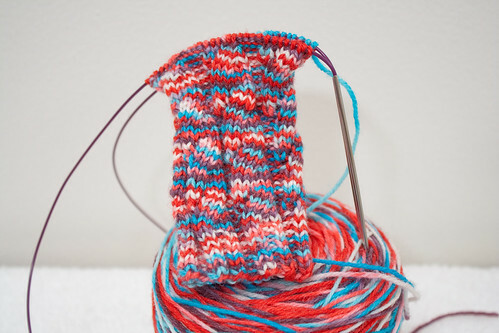 With the Gush socks off the needles, I figured I should pick out another sock pattern to knit considering it IS the Summer of Socks. After all the previous failed attempts, I decided I was going to get this Summer Spirals pattern to work for me. 54 stitches were still not enough and 64 stitches were still too much, so I figured out a way to add just the right amount of stitches. I cast on 60 stitches, adding in one purl stitch in each purl section. Now I’m basically following the 54 stitch sock with the addition of one purl stitch in each section. I think it’s working out pretty good so far. Just a few more rounds until I start the heel. Starting one new pair of socks just wasn’t enough for me! I decided to join in on the CSI: Most Wanted KAL and after a week or more of debating which sock to start with, I finally settled on Dawn Gnot using Plucky Knitter Primo in Sassy Sprout. 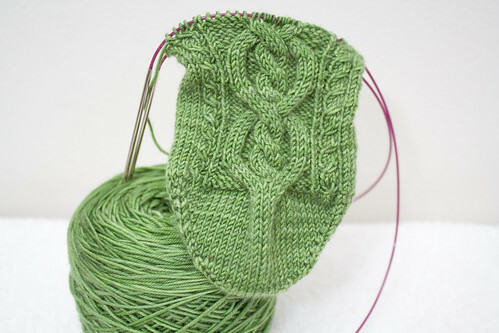 I’ve done the toe and two repeats of the chart so far. 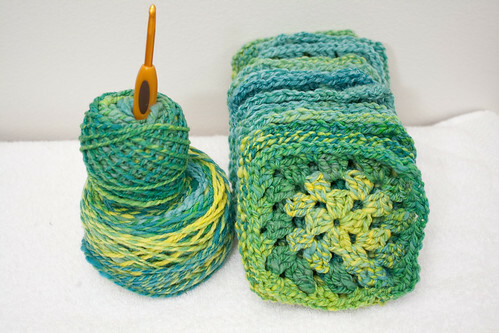 The yarn is really nice to work with – soft MCN blend with a tight twist. Definitely need some more when I can manage to snag some! This past weekend was not only a holiday weekend, but the start of the Tour de France and for the fiber spinners out there, it was also the start of Tour de Fleece! I made the decision to participate fairly close to the start of Tour de Fleece, so my only goal was to “do some spinning.” Now, I have to admit, this may have been some poor planning on my part. For some reason I knew that it started July 2nd and still thought that it must surely start later in July then that. On top of that, this past weekend ended up being a pretty busy one. I have to hang my head in shame and admit that I haven’t done a single bit of spinning yet. 😦 I suppose it’s a good thing I only joined the Lantern Rogue team, where you know you won’t be able to spin every day, since I figured there’d be a few days that I couldn’t do any spinning. I just didn’t think I’d start out with no spinning the first weekend, a holiday one at that with 3 whole days off! I plan on getting my wheel out and doing some spinning tonight. With the gym, having to grocery shop tonight, find time to make dinner, and Matt working a different summer schedule then normal, I don’t know that it’ll be that much time. Some time is better then no time, though! It’s Monday and the 4th of July holiday for those of us in the United States. It’s been yet another busy weekend and holiday, but I took some time to take photos of some recent finished items. 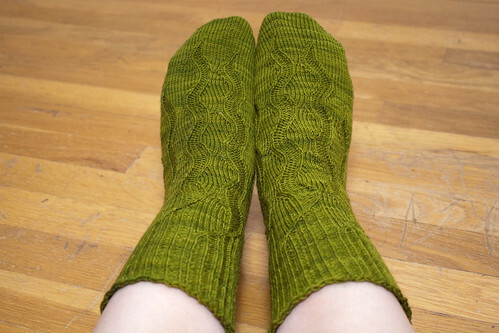 First are the Gush Mystery socks that I finished about a week ago. 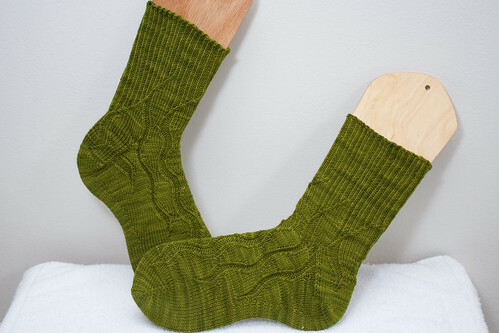 These are also the first socks I’ve finished for Summer of Socks! Notes: Only made one change. I needed to add some extra rows to get the proper length and adjust for my gauge difference. Instead of doing that where the pattern stated, I added those rows before I started the patterning. I like the way this works a LOT better then adding those rows where the pattern states to. Other then that, I followed the pattern. 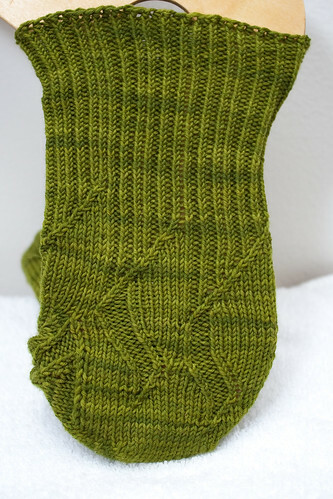 This is the second pair of mystery socks I’ve knit and I’m happy with how they turned out. Second, I have my first Camp Loopy project done! Notes: Followed pattern as written except for the bind off. Working the bind off as written for me made it too tight, so I did the JSSBO bind off instead.